The Halloween blog of Scott Axworthy. These fine fellows aren't getting older, they're getting better. More rotting jack o'lanterns here. 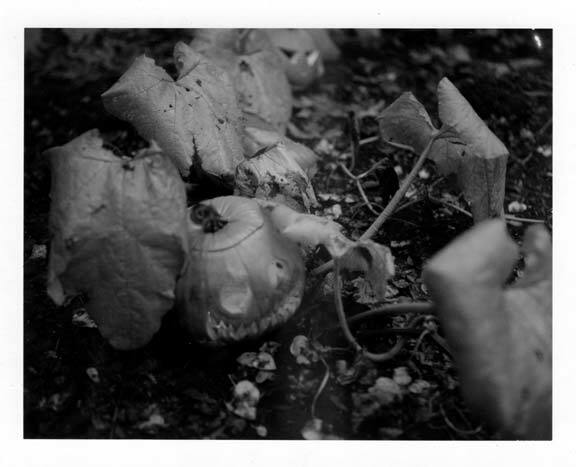 The jack o'lanterns are waning almost as fast as my stock of 4x5 Polaroid Type 54 film. As promised in a recent post, I've take a few Pumpkin Polaroid shots. I'm heartbroken that this film stock is no longer made. Unopened boxes of 20 sheets are going for hundreds of dollars on ebay now. I've run out, but just bought 12 more sheets on ebay for $37.00, which will likely be my last. On top of that, my Polaroid back that I use in my Crown Graphic is really acting up. It doesn't want to spread the processing chemical goo evenly across the picture. I lost three of five shots today, two to this problem, and one to a jam that occasionally happens. As is often the case when trying to take shots close up, the focus leaves something to be desired. It is a total crap-shoot to get the focus correct the first time under about 8 feet. But since I was low on film and losing shots to technical problems, no retakes came out. 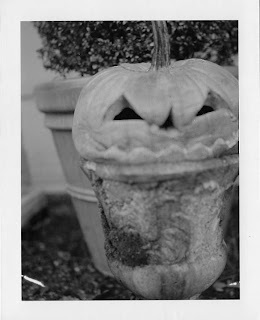 I also took more shots with my Nikon, back to one of my favorite subjects, the rotting jack o'lantern. I tried to mimic the look of the Polaroids by taking them black and white and sepia. Flying Ghost -- I've been out done!